Thanks for the question Jeff! Most metals can be used for pizza cooking, but many, like gold, are too expensive. Other metals, such as stainless steel, are poor heat conductors, and therefore not used in baking pizza crusts or baked goods. We know why steel and aluminum are the most popular, so let’s look at performance. They are pretty equal in this area. Heavy gauge aluminum and light gauge steel have equivalent performance in baking pizza crusts and other baked goods. However, like all bare metals, aluminum and steel pans must be seasoned to prevent dough sticking. Bare steel will also rust if not protected. 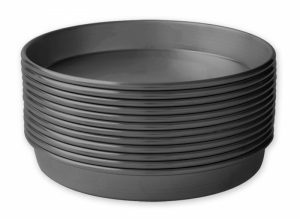 This has spawned the use of tin plating or the application of an oxide coating on pans. This coating gives us blue (or black) steel pans, which have a layer of magnetite on the steel pan that protects against rust. As you can see, we’ve moved the conversation from which type of metal should be used on pizza pans to what type of coating to use. The coating question is really more important than the metal question because the type of coating you use is going to impact the true cost of your pizza and baking pans. Some pans may be cheaper up front, but they are going to cost more in the long-run because of constant maintenance and a short pan life-cycle. Other pans may cost more up front, but require little maintenance and have a long life-cycle. At LloydPans, we believe the best pan and coating combination is an aluminum pan with our proprietary coating. The pan coating we use is permanent, so you’ll never have to worry about reglazing or recoating. It’s also metal utensil safe and the coating’s PTFE-free pre-seasoning means once you get your pans, you can put them to use immediately and not have to worry about additional maintenance costs. Read more about our proprietary coating system, or, if you’re ready to buy your pans online, visit the pizza pan section of our website.